WRAPmail (OTC: WRAP) Announces an Automated Solution Creating Interactive Email Letterheads (WRAPS) for Facebook. All Facebook users can now automatically get an email stationery based on their profile to use with their regular emails. WRAPmail, Inc. (WRAP) announced today that it has released a new solution enabling users to sign up for free with their Facebook account. WRAPmail’s software then automatically creates a WRAP (email stationery) from the users Facebook profile featuring their image, name and other information pulled from Facebook using their API. The WRAP is created in seconds and then sent to the user with instructions on how to start using WRAPmail using one of our toolbars available for Chrome, Firefox, Safari and Internet Explorer for Gmail, Yahoo, AOL and Microsoft Hotmail/Live/Outlook/365. Users of cell phones or email clients receive instructions on how to change their email setup to route their emails through our servers where they will be WRAPPED. “I am very excited about this release that will make it possible for over 1 billion Facebook users to have an automatically created interactive email stationery/letterhead that they then can use with all their regular emails” stated Rolv E. Heggenhougen, WRAPmail’s CEO. Heggenhougen added that: “We will also soon release an automated feature where these email letterheads (WRAPS) will automatically update themselves as users update their Facebook profile with new images and/or information. Next week we will also have in place a function in each users Dashboard where they can update all their email and/or social network contacts via email about their new Facebook WRAP”. CEO Heggenhougen further commented that “we believe that these automatically created WRAPS can lead to mass adoptions and soon be self-perpetuating and that obtaining a 1% success rate (1M Facebook users) is feasible.” Heggenhougen concluded that “should we reach only 10% of our 1% goal we will have added about 100,000 daily emails that are WRAPPED, and it should be very interesting to advertisers to reach this recipient audience”.. The idea behind WRAPmail is to utilize the everyday realities that almost everyone has a website, social network site(s) and also sends emails every day. These emails can become complete marketing tools and help promote, brand, sell and cross-sell in addition to drive traffic to the websites and help conduct marketing research (through tracking analysis). WRAPmail is available for free (with 3rd party ads) or for a license fee. No routines change as users simply download a toolbar or route emails via Google or WRAPmail’s servers. While the focus is on one-and one email, WRAPmail also offers an Enterprise solution where clients can send unlimited email campaigns using the same technology that avoids the RED X when emails arrive. Wrapmail’s solutions are built so that recipients see images right away and are not as quick to discard the email due to the lack of seeing anything enticing or for being afraid of viruses when they would otherwise download the images. We have no estimate whether and when these targets will be met, but we believe that this Facebook auto-WRAP solution could easily start feeding on itself as new signups let their Facebook friend know about WRAPmail. Matters discussed in this press release contain forward-looking statements. The words “anticipate,” “believe,” “estimate,” “may,” “intend,” “expect,” and similar expressions identify such forward-looking statements. Expected, actual results, performance, or achievements could differ materially from those contemplated, expressed, or implied by the forward-looking statements contained herein. Forward-looking statements are subject to a number of risks and uncertainties, including but not limited to, risks and uncertainties associated with, among other things, the impact of economic, competitive, and other factors affecting our operations, markets, products, and performance. The matters discussed herein, including the development of our automated solution creating interactive email letterheads (WRAPS) for Facebook and potential revenue derived therefrom should not be construed in any way, shape or manner of our future financial condition or stock price. For more complete information regarding our business and financial condition, you may access our filings at otcmarkets.com. According to a Pew Internet and American Life Project’s Generations 2010 report, 94% of people online send or read email. A Merkle study reports that commercial emails account for 30% of all the time spent on email which is the only category of email that has been growing over the last 3 years (other categories are friends and family, work and other). The most fascinating stat of all is that, according DMA in their 2011 report, email marketing has a higher return than all other forms of marketing. 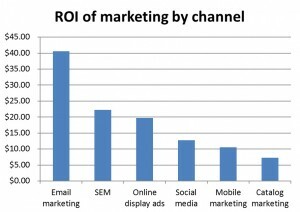 For every dollar spent on email marketing the average return is more than $40! This is higher than social media, SEM, online display ads, mobile and catalog marketing.